Are you a new OPTrust member? Have you taken an unpaid leave of absence recently? If so, applying to buy back pension service in the Plan could be one of the best financial decisions you can make. What is "buying pension service"? For OPTrust members, purchasing – or “buying back” – eligible periods of past service can be an important way to increase the value of your pension. Why? Because under OPTrust’s pension formula, a key factor in calculating your pension is how much pension service you have in the Plan. Pension service is the number of full or partial years of employment for which you have contributed to the OPSEU Pension Plan. The most common way to build up your pension service is by working. With each pay period, your pension contributions are automatically deducted from your pay cheque, and your pension service grows. service with another Canadian registered pension plan. There is a strict 24-month time limit for submitting your buyback application under the Plan’s normal calculation rules. If you miss the application deadline, you may still be able to complete your purchase as an “open option” buyback, but the cost is likely to be significantly higher. See page 3 for more information. may help you qualify for post-retirement health, dental and life insurance benefits, subsidized by the Government of Ontario. What’s more, for some types of service, your employer will also make payments towards your buyback. This may include periods as a seasonal, contract or casual employee when you did not contribute to the Plan, and some types of unpaid leaves of absence. An investment in your future: The table above shows how each year of pension service a member buys back will increase his or her pension, based on different average annual salaries at retirement. The table shows the pension increase both before age 65, under one of the Plan’s unreduced early retirement options, and starting at age 65, after integration with CPP. By increasing your years of pension service, you will increase your pension and you may qualify for a pension sooner. Joanne joined OPTrust at age 31 in 2013, after working in a contract position for five years. Let’s take a look at how buying back her five years of contract service could affect Joanne’s OPTrust pension. A larger lifetime pension: By increasing her years of pension service, Joanne’s buyback will increase her annual pension and allow her to retire two years sooner. This will have a big impact on the value of her pension over her lifetime. Let’s assume Joanne can expect to live to age 84. If she does not buy back her contract service and retires at age 60, her total lifetime pension will be approximately $589,600. If she completes her buyback and retires two years earlier, her lifetime pension will be $725,600, or $136,000 more than without the buyback. What types of service can you buy back? There are several types of past service you may be eligible to buy back. This includes periods when you did not contribute – such as seasonal, contract or casual work. It also includes periods for which your contributions were refunded or your pension was transferred out of the Plan. These plans must Canadian and must be registered under the Income Tax Act. This includes pregnancy, parental, adoption and family medical leaves, leaves due to illness or while receiving WSIB benefits, and special or educational leaves. For more information, see the OPTrust fact sheet Leaves of Absence and Your Pension. This includes periods when members are legally on strike or locked-out or are temporarily laid off due to a strike or lockout. Under the OPSEU Pension Plan there is a strict 24-month time limit for submitting your buyback application under OPTrust’s normal calculation rules. To buy past pension service with an OPTrust employer or service when you contributed to another employer’s pension plan, you should submit an application to OPTrust within 24-months of the date you first become a member of the OPSEU Pension Plan or the PSPP. Meeting the 24-month application window allows you to complete your purchase within a 10-year, three-month payment timeline. For periods when you were unable to work due to a legal strike or lock-out, you must apply within 24 months of the date the strike or lock-out ends. If you miss the Plan’s normal 24-month application deadline or you do not complete your payments within the 10-year, three-month payment timeline you can still apply to purchase your leave as an “open option” buyback. However, in most cases an open option buyback will cost more – in some cases significantly more – than if you apply within the normal 24-month deadline. For more information see the OPTrust fact sheet on Open Option Buybacks. There are three reasons we suggest you apply to buy back pension service for any eligible past periods of employment, even if you decide not to complete your purchase right away. Applying within the Plan’s 24-month application time limit will ensure you qualify for OPTrust’s normal buyback calculation rules. If you miss the 24-month cut off, you may still be able to complete your purchase as an open option buyback, but the cost will likely be substantially higher. Delaying your application may increase your cost, even if you apply within the 24-month window. Why? Because any increase in your salary before you apply will increase the cost of your buyback, too. Applying early costs you nothing, but buys you time. Once you receive your buyback quote, you will have up to 10 years to complete your payments, pay for part of your service, or choose not to buyback. Once OPTrust receives your application, we will send you a quote showing the cost of your buyback and your payment options. Your 10-year payment window begins three months after we mail you the cost quote. OPTrust accepts buyback applications through secure messaging in Online Services, letters, over the telephone, or by completing a Application for Past Service (OPTrust 1036) form. The only exception applies to making contributions while on an LOA. Applying to continue your pension contributions during your leave. For pregnancy, parental and adoption leaves, if you are receiving a Supplementary Unemployment Benefit (SUB) allowance from your employer, you can apply to continue your pension contributions through payroll deductions. For other unpaid leaves – including pregnancy, parental and adoption leaves when you are not receiving payments from your employer – you can arrange to pay your contributions directly to OPTrust. OPTrust will contact you if we need additional information or documents to confirm your buyback application or calculate the cost of your purchase. How much will your buyback cost? If you apply to buy back an unpaid leave of absence online, you will receive your cost quote immediately. If you submit an Application for Past Service form, we will calculate the cost of your buyback and send you an Agreement to Purchase Pension Service. This agreement outlines the cost of your buyback, your payment options, the increase in your estimated pension if you complete your purchase, and your retirement eligibility dates with and without the buyback. 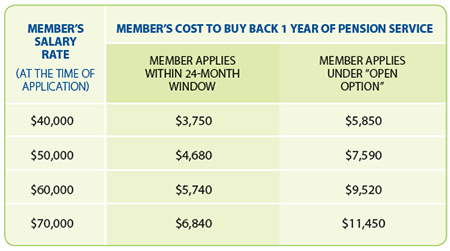 whether you submit your application within the Plan’s 24-month window or apply later for an “open option” buy back. The following describes the calculation method used. Unpaid leaves of absence Based on contribution rates Yes for parental, illness and WSIB. OPTrust has a number of online tools and resources for members who are interested in buying back pension service in the Plan. Use our secure Online Services to apply to contribute during an unpaid LOA or buy back your leave when you return to work. Use Online Services to check the status of current buybacks (excluding actuarial buybacks), review, select or change your payment options, and view and print your most recent Annual Buyback Statement. For copies of OPTrust’s fact sheets and our Application to Contribute During an Unpaid Leave of Absence and Application for Past Service forms visit the member’s section of the website. The member’s cost for an open option buyback equals the “actuarial value” of the service you are purchasing. This means that you will pay the full cost of funding the projected increase in your lifetime pension. Your employer does not share the cost of an open option buyback. If you opt to pay for your buyback through payroll deductions, the interest rate for financing your buyback will be higher than if you apply within the 24-month time limit. The following table shows examples of the member’s cost for purchasing one year of past non-contributory service with an OPTrust employer, based on different annual salary rates. if the member applies after the 24-month window (open option buyback). Important: This example assumes the member is 40 years old when they apply and will be eligible for an early unreduced pension at age 60. Because the cost of an open option buyback equals the actuarial value of the period of service, the cost will vary significantly depending on your age and when you will be eligible to retire with an unreduced pension. Lump sum payments: In most cases, you can pay for your OPTrust buyback in a lump sum, by cheque, money order or through a direct transfer from a tax-sheltered source such as an RRSP. In some cases, a direct transfer from a tax-sheltered source may be the only payment option permitted by the Canada Revenue Agency. OPTrust will provide your options when we send you the cost quote. Payroll deductions (financing option): For buybacks costing more than $500, you may have the option of paying through a series of biweekly payroll deductions. This option is available to regular full-time and part-time (not seasonal) employees. Your payroll deductions will include the total principal cost of your buyback, plus interest. Combined lump-sum/payroll deductions: Regular full-time and part-time employees may also choose to pay through a combination of lump sum payments and payroll deductions. For this option, at least $500 of the principal must be paid through payroll deductions. Other options: Members who are on an unpaid leave of absence, including WSIB or LTIP, or who work on a seasonal or casual basis are able to make other arrangements to pay for their buybacks. Options include regular monthly or quarterly cheques sent directly to OPTrust. Once you receive your online quote or Agreement to Purchase Pension Service form, there are several time limits that will affect the start and completion of your payments. Online quotes: Please select your payment arrangements as soon as possible. For online quotes, interest starts to accrue three months after the date you receive a quote. Paper quotes: Please return your completed Agreement to Purchase Pension Service form to OPTrust – along with your lump-sum payment or payment instructions – within 45 days. Interest: For members who make full payment within three months of the date of your quote, no interest is applied. Payments made after the three-month window will include interest until the buyback is complete. Actuarial buyback quotes expire after 90 days, after that time OPTrust will calculate a new cost. Your buyback may affect your income tax in two ways: by reducing your taxable income, and by reducing your available RRSP contribution room. Canada’s Income Tax Act limits the amount of savings you can accumulate in different types of retirement savings plans without paying for tax up front. Under these rules, the benefit you earn in the OPSEU Pension Plan for periods after 1989 reduces your available RRSP contribution room. OPTrust takes care of reporting the relevant information to the Canada Revenue Agency on your behalf. OPTrust will provide you with an income tax receipt, reporting any tax deductible buyback payments you make in a given year. Your receipt will be mailed by February of the following year, in time for you to report the buyback contributions on your annual income tax return. Your OPTrust pension contributions are tax deductible. This applies to your regular contributions to most buyback payments made to the Plan. For more on buying back pension service, see OPTrust’s fact sheets on Leaves of Absence and Your Pension, Open Option Buybacks, and Contributing to Your Pension while on WSIB.